Should You Switch to a Standing Desk? For the last few years, I’ve been coming across articles extolling the benefits of standing desks. Due to being a digital nomad, however, I’ve found it difficult to actually get one and try it out. 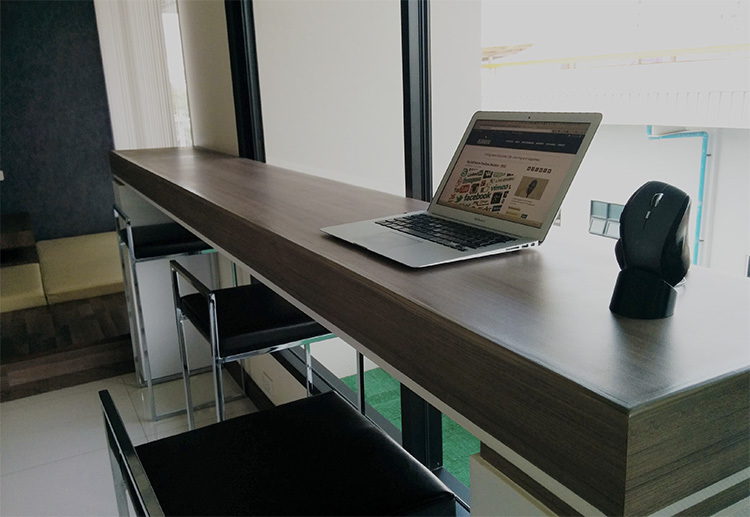 Finally, in our condo building in Chiang Mai (Thailand), I found the perfect place to experiment with standing desks. This was the first experiment with working standing up. In Chiang Mai I got the opportunity to switch between a standing desk and a traditional seated desk in the same office. Perhaps more worryingly is the fact that research has indicated that sitting is killing us, shortening our lifespans by up to 15 years. Sitting has also been referred to as the new smoking in terms of harmful effects. Many people try to restore balance in their lives by sitting for six hours at work and then heading to the gym afterward, however, this does not seem to do the trick. Evidence suggests that the negative effects of extended sitting can’t be countered by brief bouts of strenuous exercise. Why Did I Want to Try it Out? I am trying to lengthen my hamstrings and spending the whole day sitting is one of the sure-fire ways of getting short hamstrings. My concentration and comfort levels were waning after a few hours at my desk. I’m always up for anything that improves my health and posture. Here’s what I noticed in the few weeks I spent experimenting with a standing desk. I love listening to music while working (mostly classical, ambient, jazz and euphoric trance genres). I also love dancing and have a natural instinct to move according to the melodies and beats I’m hearing. Being in a standing position I could very easily do my discreet dancing thing while working. This did not negatively affect my productivity, on the other hand, I found it bolstered my mood tremendously and helped me stay focused. I found myself sticking to jazz and euphoric trance while in a standing position, then switching to classical and ambient while reverting back to the seated desk. Standing up and being in a good mood definitely helped me keep a better posture, especially when compared to the typical hunched position we adopt while sitting down. So a standing desk is a win from this point of view as well. Being in a standing position and continuously moving proved to be a boon for my energy levels. I also found it easier to move around, perform a few stretches and some yoga routines while in a standing position. Nothing that will give me an immediate improvement in my fitness levels, but something that might be crucial from a long-term perspective. My feet get sore incredibly quickly when standing. That’s the number one reason why I don’t go to concerts which have no seating. By the time the band comes out my feet would be killing me and I would be in no mood for anything other than a comfortable couch and getting my feet off the floor. This is why I was very doubtful about my abilities to withstand hours at my standing desk. Apparently, a good mat is essential when working at a standing desk, but I haven’t used one until now. My feet have become sore while standing, however, the fact that I tend to be continually shifting around rather than in a stationary position has helped make the whole thing bearable. I’m hoping that my feet will become more resistant with time. I also experienced shoulder soreness, but that was to be expected given the ergonomics of my setup. The screen should be at eye level while since I was using a laptop it was way further down than it should be, hence the shoulder/upper back pain from having to look down all the time. So I don’t blame the standing desk for this, hopefully. Since moving to Barcelona and basing myself there, I had the luxury of building my own home office. got the one with the curve, as you can see in the photo. This was probably the hardest decision in configuring the desk, but in the end, it was the right decision because it looks very cool and is much more comfortable than a straight edge, both while sitting and also while standing. I also want to mention the amazing customer care that Fully Europe provide. They dealt with a small issue I had with the desk and made sure that I was fully satisfied with the product. They also addressed my concerns about the bamboo and chemicals used in the production of the desk. If you look at a few reviews online you’ll read about the negative effects of bamboo production (deforestation) and also the chemicals used in the production of such desks. Thankfully Fully were able to provide me with a lot of information about their sources for Bamboo (sustainable) and also information about the chemicals used in the production process (not harmful). I’m very happy with this desk and feel that it provides the best value for someone looking to get started with standing desks. There are cheaper alternatives but they all have serious reliability issues. There are also much pricier alternatives, but I would only recommend those if you already have experience with standing desks and you’re looking to achieve a particular look and feel in your office that you can’t achieve with the Fully desks. In the article Why I killed my standing desk Mikael from web/mobile agency Crew describes his experience with standing desks, which resulted in him going back to a modified version of the traditional seated desk (legs up, back leaning backward). It’s a very interesting article citing numerous studies, and worth looking into before you make your own decisions. Based on my experience so far, and that of colleagues who also use such desks, my feeling is that having both a standing and a modified sitting desk is the way to go, switching between the two as needed. A standing and adjustable height desk allows you to do just that. You can sit or stand to improve circulation and decrease fatigue. After a few days, you’ll notice sharper focus. I stand within my inactive workplace at the job sometimes, by tilting my display screen, and mounting my mouse and computer keyboard on two clear photocopier newspaper bins. It is effective, since it allows me to get right up and maneuver around whilst working temporarily, (I walk at that moment at exactly the same time), but I reach sit back again lacking any issue when I have to – health issues make my feet go numb and then start cramping. Great post, Jean! I’ve been using a standing desk for the last couple of years while I travel and I couldn’t go back to sitting all the time. A more recent addition that I’ve made to my set up is a Kinesis Freestyle 2 split keyboard for Mac, it makes a huge difference to my shoulders. Quite expensive for a keyboard but worth the investment. Thanks Chris, I’ll definitely be checking out the Kinesis. You mention that you have been using a standing desk while traveling, how does that work? Do you find a new desk each time you land somewhere new? I’ve been using the ninja standing desk, which sets up by hooking over a door. It also comes with hooks to go in a dry wall but that’s not really practical if you’re staying in rented accommodation. It is a bit cumbersome, but mostly I travel with a suitcase and it fits in that fine. There have only been one or two places that I’ve stayed in where there isn’t a door to set it up on, and they have been short term stays. Oh hadn’t seen this before, what an awesome invention, thanks for sharing!